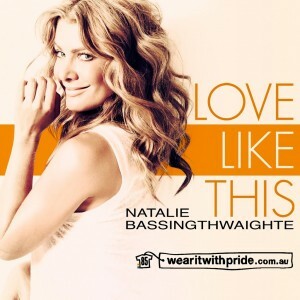 Aussie songstress Natalie Bassing-thwaighte has premiered the video for the fifth and final single from her debut solo album ‘1000 Stars’. The track has been released to raise awareness of the Aids Council Of New South Wales’ current ‘Wear It With Pride’ t-shirt campaign in the lead-up to this year’s Mardi Gras parade. The clip features a number of cameos from a variety of TV presenters including The Morning Show’s Kylie Gillies and Today’s Richard Reid, along with Dr.Kerryn Phelps and Courtney Act, all of whom are wearing a selection of ‘Wear It With Pride’ t-shirts (which are available HERE). The track is set for digital release on Friday. love the video and i got a question is there any idea if it will be released as a physical single or just digitally? Yay for Nat Bass. Hope it does well.